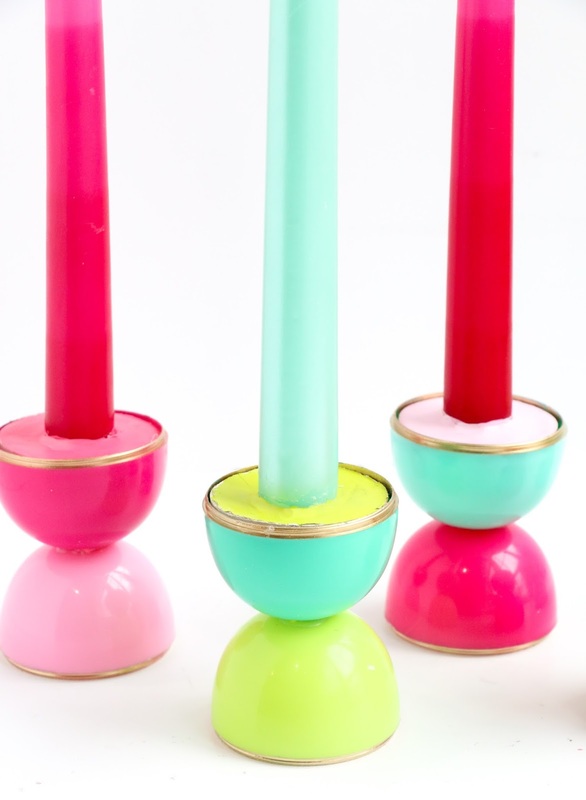 I sure hope you haven’t gotten tired of the whole “look what I made these plastic Easter eggs into” thing, because I have just a couple more projects to share with you, and these colorful DIY color blocked candle holders are one of them. Just a few plastic Easter eggs, a bit of air dry clay, and paint is all you need to create your own stunning taper candle holders that are perfect any time of year. Let me just say that there are several things that I love about using these plastic eggs for crafting. The first is that they are so cheap! Seriously, a bag of of them for only $1 at Target means so many crafts for so little money. And two, the colors are just perfect. The plastic eggs from Target aren’t those primary colored eggs, they have colors like coral, and emerald, and lime green! So pretty. 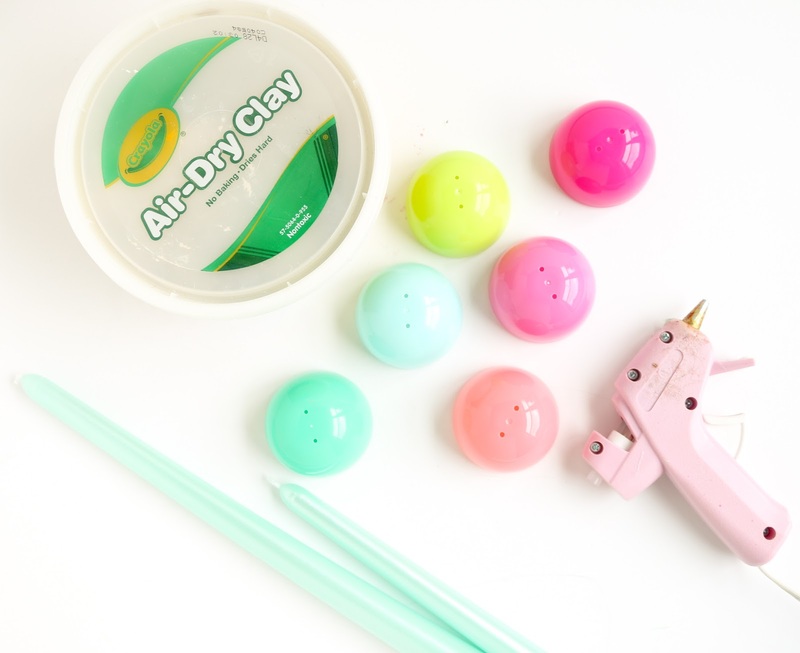 Given that if you can’t find the colors you like or don’t have a Target to shop at, you could always use spray paint to paint regular plastic eggs just the color you want. 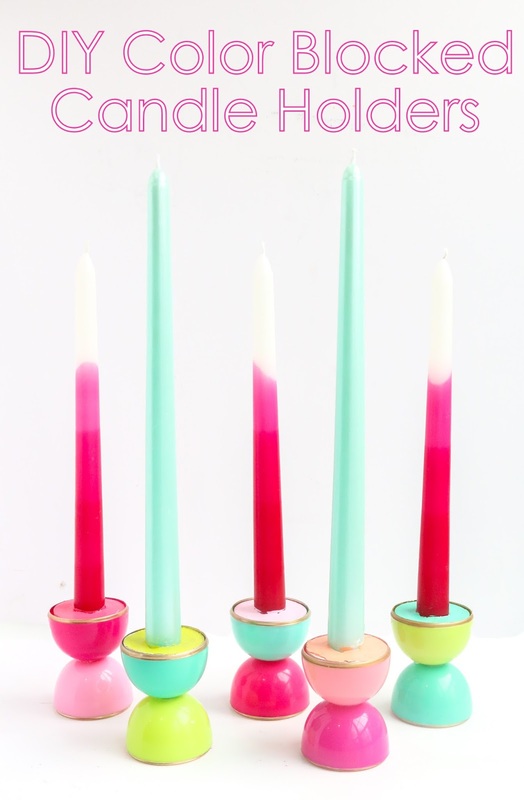 So, now that you are drooling over the candle holders, lets find out how to make them! Follow along below for the full tutorial. Begin by gluing two Easter egg bottoms to each other so that you have an hour glass like shape. You will want to check to make sure that the eggs are level and glued directly at the center. Now that you have your candle holder base, you will want to make a large ball of clay and use it to fill your candle holder to just level or slightly below the sides. Then using your taper candle, press into the clay to create the candle groove in the clay. 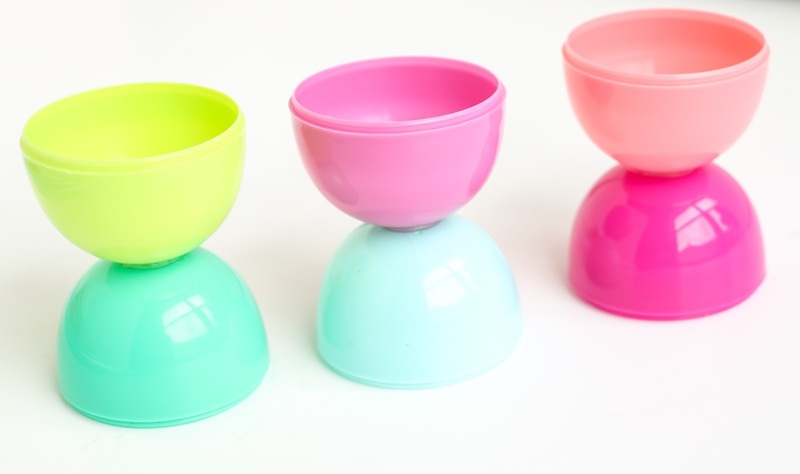 Now use your gold paint pen to color the top and bottom edges of your egg cups. You may need to use a bit of water to help smooth out the clay and create a nice even surface at this point. Once it is smooth, let the clay dry for several days before painting it with your acrylic craft paint. If you are impatient, you can use the candles as they are above too. Note that the clay will contract and shrink a bit when it dries which will make the clay ball wobble and rotate in the egg cups. To help correct this, I simple filled the cups with a decent amount of glue and glued the clay into the cup. 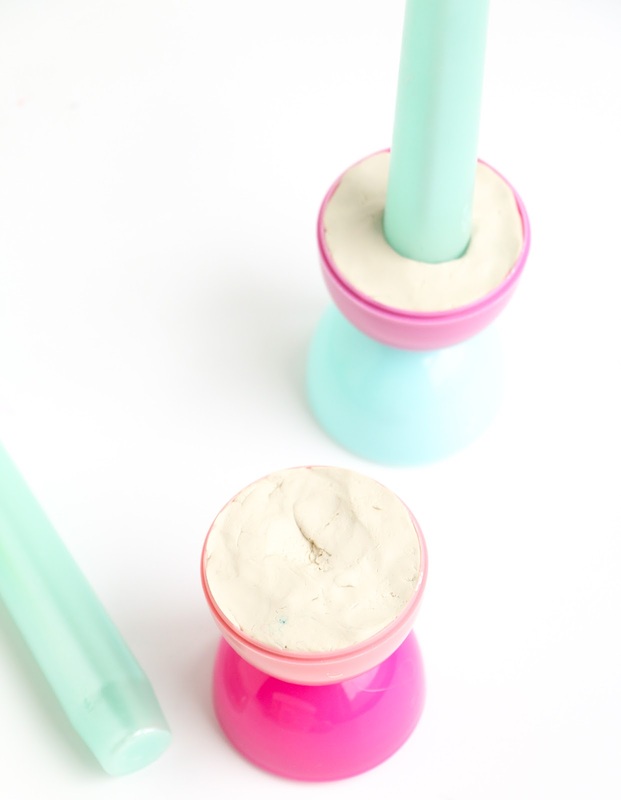 You may also need to do this with the taper candle in the candle holder portion of the clay. But since I just let the clay dry with the candles in place, I didn’t have to worry about that. Aren’t the cute?! 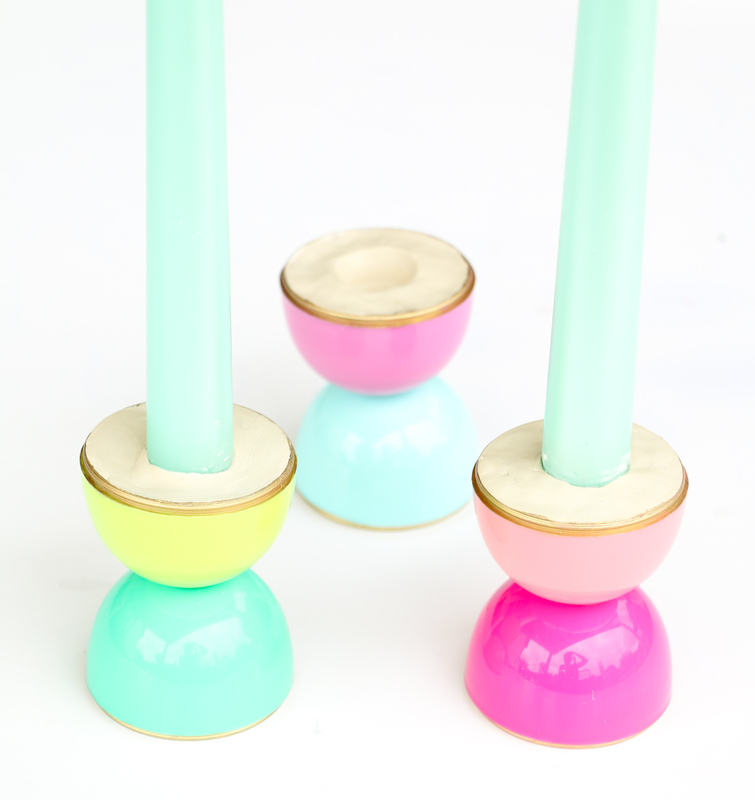 I love the bright colors and pops of gold in these candle holders. I don’t think anyone would suspect that they are Easter eggs either! I use these candles as decorations on my table and mantel, but I haven’t actually lit them yet. I would guess that they would be fine for a quick dinner, but you probably don’t want the wax to actually melt so much that it starts to touch the plastic. I am not sure how hot the wax is or whether it would melt the plastic holders, so experiment with that with caution. But who needs them to be lit anyway? Not me, I just like the look of them as is! You do the MOST creative stuff with this simplest of supplies! Love these!